If you want to create quality you have to keep a grip on the whole production process. That is why we produce the components we need in our own production facility or source them from local suppliers. 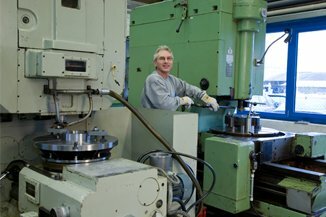 We also assemble the machines at our factory and no machine leaves the premises without an extensive test run. Our qualified engineers and technicians have a comprehensive tool park available in our production halls, from gear-cutting machines and lathes and high-speed machining centre through to the latest environmentally friendly paint shop. In addition to quality assurance this also means we can accommodate every special request, from special blade installation, steel constructions adapted to conditions on site through to the colour of the machine.